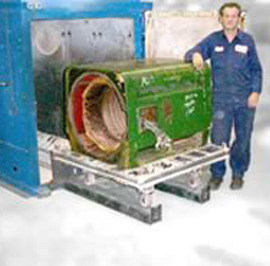 This 300 HP Electric Motor was stripped in an ACE Radiant Tube Burn Off Ovens System. 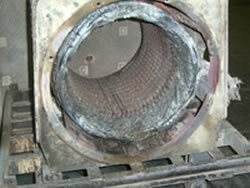 Using the One-Touch Control System, the stator was completely burned in 4 hours and 30 minutes. Time: 4 Hours, 30 Mins. Thermocouple Reading, Stator Core: 783° Max. 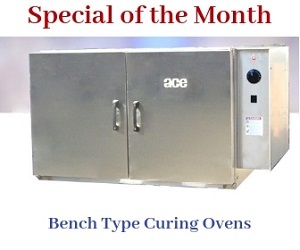 The latest technology in Burn OFF Ovens is the new "RT" series. 93% efficiency, uniform temperatures and NO hot or cold spots. Read Blue Rhino Radiant Oven Testimonial here. 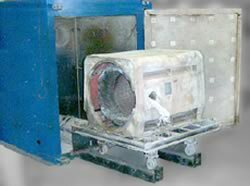 More about electric motor cleaning with Burn OFF Ovens.